I was in Guangzhou in early August and I had an enjoyable time having tea with my tea drinking groups as well as with my tea wholesaler friends during the week there. I witnessed a carton of 2008 ChenShengHao 'year of the rat' edition changed hands at slightly more than 10k RMB per cake. I remarked that this tea was already 10 years old and the buyer would enjoy the taste and aroma of a 10 year old banzhang pu erh. My wholesaler friend laughed at me. He told me most of the Banzhang sold by him are unlikely to be brewed and drunk. Most of these expensive tea are kept and resold, never drunk. He explained that there were good returns for such tea especially before 2012 production. One could see very good returns if the buyer stored his/her cartons of tea well over this period. My wholesaler friend says that prices of new tea are high now and there are many 'investors' of tea in China. The returns of newer tea are now much lower than if one has invested in tea 10 years ago. I was disturbed. I told a Chinese tea drinker group about this finding when I had tea with them the next day. This tea drinking group of 6 were mainly tea collectors / drinkers. They would open a cake, cheap or expensive to drink, without hesitation. My friends would normally drink their pu erh after more than 10 years of storage. These friends also believed that the many expensive 'branded' pu erh tea are purchased and stored away and not drank at all. Examples would be the Dayi tea special edition pu erh cakes. One collector felt that even old Yixing factory teapots are also now bought and stored away as investment pieces and they are never used for brewing tea. interestingly, this group of tea drinkers rarely buy new tea now, citing the very high prices as one of the reasons for the non purchase. 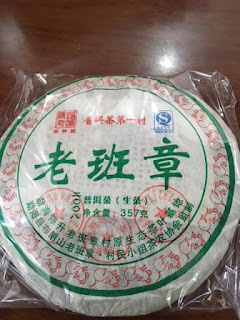 I believed that about 50-60% pu erh production are purchased purely for investment purposes. Small retailers and tea drinkers/ collectors would make up for the rest of the tea. My readers would know that this news are not 'earth shattering'. Tea forums and tea blogs have already highlighted this pu erh trend. As I gazed at my dusty crystal ball, I believed that these 'stored away' tea will appear in the tea markets again only in one scenario - in very bad economic times. When business environment turns sour, investors may have to liquidate their assets for cash, a force selling situation. In very good economic times, these tea will also be sold for a profit but this tea simply changed hands to another buyer who will store them away hoping for a higher profit. The pu erh tea industry now is highly dependent on speculators and investors to support the higher prices of the pu erh tea markets. Yes, most of the expensive 'branded' pu erh tea are never drunk. How is the quality of this tea? Has the tea aged well? For now, the only important question in the tea markets is "How much is the tea?". Grant us the serenity to accept the things we cannot change, the courage to change the things we can, and the wisdom to know the difference. It appeared to me as well that mainly the branded pu erhs increase gradually in price, even the mid-segment. Teas from smaller brands,factories or small producers have difficulty to increase because there's hardly any transparency. They're just not as trusted as Haiwan or Dayi.